The www.ashrosary.org is defined as publicly accessible and password/login protected pages hosted under the domain www.ashrosary.org. Sacred Heart is not responsible for the privacy practices of external sites linked from or referenced by www.ashrosary.org. This policy applies solely to information collected by this website. 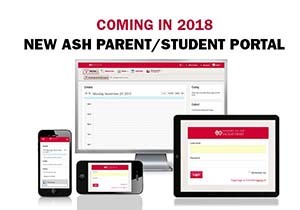 Several areas within ashrosary.org enable you to pay for dues or donations to the school online with a credit card. Unless otherwise noted these transactions are encrypted and there is no refund available once the donation transaction process is complete. Sacred Heart takes every precaution to protect users' information. When users submit sensitive information via this website, it is encrypted and remains secure during all stages of transmission. The school complies with all state and federal statutes requiring safeguards on specific types of information. Sacred Heart is enrolled in Trustwave's Trusted Commerce program to validate compliance with the Payment Card Industry Data Security Standard (PCI DSS) mandated by all major credit card associations including: Discover, Mastercard Worldwide, Visa, Inc. and Visa Europe.